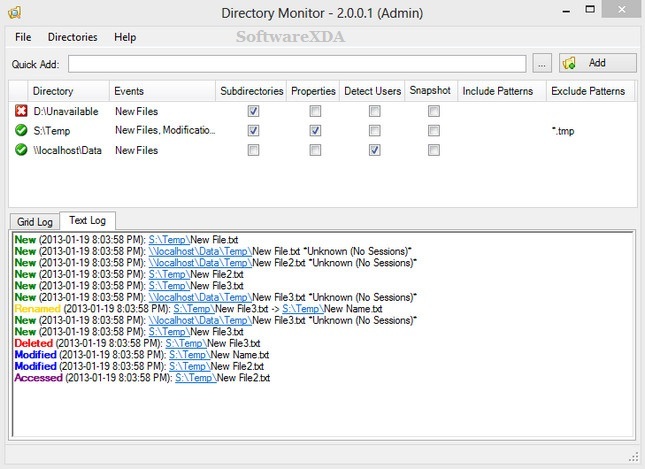 Directory Monitor Pro is one of the best software to You can use Directory Monitor for the surveillance of certain directories and it will notify you of file changes, deletions, modifications, and new files in real-time. You can optionally execute an application when a change occurs. • Monitor directories for file changes, modifications, deletions and new files in real-time. • Monitor local directories or network shares (including hidden shares). • Run as a Windows service. • Optionally execute an application when an event occurs. • Log the user on the network that made the changes. • Include/exclude filtering on files being monitored. • Quickly tell if a directory is available and being monitored. • Balloon notifications whenever an event is fired. • Auto updating, import/export and more.